Instant Car Donation was founded with the goal of bringing donors and local charities together with an efficient and pleasant process. You can focus on deciding which of our respected charities is right for you instead of worrying about difficulties of researching how to make a donation. After your free pickup, we will assist you in recieving the best tax benefit possible for your generous gift. We take pride in helping smaller charities easily receive car donations, bringing people together while helping support those in the Olathe, Kansas community who need it the most. Here are some of our favorite charities in the Olathe area. We have made sure each of them are eligible for tax deductions when you help your local community by donating your car. Your values and choice can make a difference. The mission of Global Scholars is to bring glory to God and impact the world by developing godly leaders for every sector of society - government, business, home, church, the arts, law, the sciences, education - as we provide key universities and academic institutions with educational services and Christian faculty who teach and live in such a way as to draw others to faith and transformation in Christ. Global Scholars places faculty from a wide range of disciplines in teaching positions at secular universities outside North America. The vision of Global Scholars is that someday each university student in the world will have at least one professor who articulates and demonstrates the love and lordship of Jesus Christ. Founded in 1996, GOD TV, with a servant's heart, uses media in all its forms to broadcast the Father's heart to every nation, to reach the lost and equip believers for the harvest. We will be leaders in the creative world, setting a precedent and reflecting the Father's own incredible creativity. Our passion is to develop a new breed of Christian media with cutting edge creativity and a spirit of excellence; to source, create and present world class anointed, prophetic and supernatural content; to broadcast relevant, highly creative programming straight from the Fathers heart filled with His glory and anointing, His power and presence, reconciling man, woman and child with God by the power of the Holy Spirit. KidsTLC is one of Kansas City's largest organizations providing children with a continuum of care through innovative and successful psychiatric treatment, community outreach, outpatient behavioral health, autism and wellness programs. Services are focused on evidence-based therapies and trauma-informed care, with a strong emphasis on family wellness and preserving the family unit. KidsTLC continues to respond to the growing needs of children in the Kansas City Metro area by adding critically needed services that fill community gaps and alleviate wait times for families to receive care. There are lots of non-profit organizations, like GOD TV, in your local Olathe area which could benefit from your vehicle donation. We not only help you donate to a charity, but we focus on providing an effortless means to local non-profits so that they can focus on their work to take donations. The donation will make the biggest difference for charities, for example KidsTLC, bringing together people while helping encourage those in their neighborhood Kansas community who need it the most. It is important to Instant Car Donation which you get the greatest tax deduction benefit without needing execute research or to navigate complexities possible. We pre-qualify all our participating 501-3C non-profit charities to verify your donation will be tax deductible. The process will be streamlined for both you and the charity of your choice, for example KidsTLC. We'll provide you after your completed donation with a 1098-C tax document. Car donations are the most accountable method for individuals to create a contribution. Because of this, one of their aims is to empower those electing a choice by ensuring that the car, such as a Ford '34 , goes to the charity that reflects their values. We always make charity decision an essential part of the process, when donating with us. We can do this in case you would like us to pick for you that charity would be helped the most. In case you have a charity in mind you want to donate to, then you can donate with us. While there are lots of benefits to charities which receive donations from people, the advantages to the you, the donor may not be too clear. The biggest advantage which the majority of men and women hear about is the chance for a tax deduction. This means that the resale value of the donated vehicle can be written off on your tax return. There are some limits on this kind of deduction, so you may choose to talk to a tax pro before making the donation. Another benefit of donating a secondhand car to charity is the chance to just eliminate the vehicle, like your Buick LaCrosse, without needing to try to repair or sell it. Most charitable car donation programs will anyhow vehicles if they're operating or in need of repair. Some trucks or cars which are beyond repair will be sold for parts or scrap along with any cash received will go to the charity. Car donation programs are becoming more popular in Kansas over the past ten years or so, as more charities are looking for new and innovative ways to create funds. Nowadays, the number of charitable vehicle donation programs is in the hundreds or perhaps thousands. When you've got a favorite Olathe charity you want to make contributions to, it's probably possible for this charity to get at least a portion of the funds when you donate your old vehicle. Besides the charitable tax benefit rather than getting the hassle of managing an older car, the sensation of having the ability to help those in need might be the very best reason to donate your automobile, like a Isuzu Stylus, to a charity. Most used auto donation programs will either sell the vehicle to raise funds for the reason, use the vehicle, like a Porsche Macan, in the everyday operations of their organization, or give the vehicle, such as a Acura ILX, to a someone in need either for free, or even for less than the fair market value. Charitable car donation programs allow you to donate your secondhand car to the charity of your own choice. Visit our charities page to locate a charity in Kansas to donate to. When you decide to create a donation of a used vehicle, if the charity sells the car to get over $500 they need to mail you a receipt which lets you deduct the sales price of the automobile, such as a Honda HR-V, on your tax return. If the old car you opted to donate is not worth at least $500, then the IRS lets you ascertain the fair market value. This is the value that someone would be happy to spend money on the car, such as a Cadillac XT5, if purchasing it from you. You receive the tax benefit, and the charity gets to utilize the vehicle, like a GREENTECH AUTOMOTIVE GREENTECH AUTOMOTIVE, or sells it and uses the profits for the good of the charity. That is a win-win for everyone involved. Can there be a financial tax benefit for donating my car or truck in Kansas? We can ensure your vehicle, like your Ford P700, belongs to some non-profit organization which is qualified for tax deductible donations and assist you recieve a reciept for the donation. You might have the ability to have a tax advantage for your vehicle donation should you itemize your deductions. For contributions around $500 you're able to utilize Kelley Blue Book and also for larger contributions the charity must verify what they recieved for the auto donation (more info). 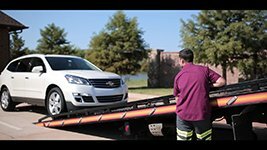 We'll arrange a tow truck to come pick up your car and deliver it for you. It couldn't be much easier now, to help your charity, like GOD TV, of your choice! Do you accept donations for cars and trucks which are lost or damaged components? Absolutely, we accept cars in all conditions! Go to the form and ask to contribute, and our Olathe team will see what we can do. Would you help me locate a Olathe charity that suits my personal principals? We'd love to assist you make sure your donation goes to your cause in Olathe you care about by helping you select a non-profit organization that satisfies your own values. In actuality, it is so important to us we do so each single time you give with us! Who can I donate my car or truck to in Olathe? Instant Car Donation proudly supports many respected national & local Olathe organizations in the area. Our Olathe team works with dedictation for you to be sure the organizaion gets maximum support from your car. All owners on the car title must finish the section of the title labeled "assignment of title by owner" or "transfer of ownership by seller". The majority of states require registering and printing owner names. You need to fill out any fields that need information about a buyer/purchaser/transferee with information. Instructions may be found by you here. First we will contact the charity of your choice (or select one for you whether you asked that rather than picked) to make certain they need your car, like a Subaru Baja, which takes about one business day. We'll arrange to come for you for pickup. If it is taking a little longer don't hesitate to get in touch with us. Are you considering donating a car in Olathe, including a Th!nk Th!nk Neighbor, however, wondering what impact this may have for your charity of your choice? If that's the case, keep reading to see how your car donation in Olathe may be a true difference and effect on small and medium-sized charities like KidsTLC in your area. One of the biggest challenges for smaller businesses with a few or no paid employees is the best way to increase their funds and preventing volunteer burn-out. Global Scholars at Olathe, Kansas, is such a non-profit. Global Scholars's assignment is performed by several volunteers. Because nearly all work is accomplished by volunteers, then the charity's tasks are performed by volunteer employees, many of who lack skills which the non-profit should flourish. In fact, many times the particulars of fundraising efforts are determined based on who is available to take them out, rather than what would be the best means to fundraise. Should a tiny nonprofit like GOD TV be in a position to receive a automobile donation, including a Chrysler Sebring? We think so! However, what about all of the logistical service, money and time that is needed to organize the tow truck along with the sale of your automobile at an auction? It appears unlikely that a charity such as this would truly have the ability to take on selling your preferred car, even if you decided to donate it to them. That is where we come in. We associate with any and every non-profit who wants to receive a auto donation, like Global Scholars, and offer our experience and aid in processing the auto donation. Then we be certain the charity receives the most donation it could receive so it may increase its operating funding and finance new and current programs. Your car donation could be worth a few hundred or even a few thousand bucks or more, based on the vehicle that you donate. Even though it may not look like a lot of money, it is an unplanned windfall for a small or medium-sized charity such as KidsTLC. Still considering donating your car to a charity in Olathe? We can assist! Just click the contribute button and let us know that you are, and we are going to arrange your free pickup and to sell your vehicle. We will also get the charity of your choice, and ensure that they get the money they should continue their good and important job in our local community. Do you have a vehicle, like a Porsche 968, simply sitting in your garage or in your driveway that you've been meaning to eliminate? Perhaps you think that it is too old, or it is in need of repair or refurbishing. A lot of us are willing to leave an unnecessary car sitting in our our driveway for years without spending time or money to fix it. So that automobile sits, and sits and sits. Let's be honest. Are we likely to put in money and time to fix that car? If we had been, wouldn't we've done it? Not only is that older car an eyesore, but we're also missing out on the chance to apply this valuable resource to aid a charity such as Living Beyond Breast Cancer! One man's crap is another person's treasure, or so they say. This is certainly the case with car donations. A vehicle, like a Electric Mobile Cars Electric Mobile Cars, that is unnecessary by you can provide just the correct amount of financing to a charity at Olathe or outside to meet its budget for a present or future job. When you donate your car, you are giving a precious treasure to a charity, because your donation helps them to keep their work locally. Global Scholars in Olathe, Kansas is such a non-profit. Its call to activity is directly encouraged by your contribution--you can enable the charity of your own choice, like KidsTLC, to expand the reach and breadth of the great actions in the neighborhood! We pride ourselves in assisting you to convert your unwanted auto to real treasure! Click the contribute button now to start the procedure. After you tell us that you're ready to donate your vehicle, we'll arrange to get a completely free pick-up in Olathe or your neighborhood area and sell your vehicle. All you want to do is let us know which respected charity meets the phone of your spirit, and we'll finish up. The very best part is that should you receive the advantage of clearing out old, unnecessary junk, you get to offer financing to the charity of your choice, like Second Harvest Food Bank of Central Florida, and finally, you receive the maximum tax advantage for your donation. We'll provide you with a tax receipt for the contribution, and ensure that the charity of your choice receives the contribution in addition to the required IRS paperwork to accept your contribution. Junk is out, simple living is in. Most of us are up to our ears in things, and some people are trying to do anything about it! We're doing things like taking our clothes into Buffalo Exchange or giving up on buying new things for the time being attempting to make do with what we have. Who'd have believed that some Americans would give up their houses and build tiny efficient ones rather? It isn't having things the thing which brings us pleasure. It's what we do with all what we have that matters most. We may have considered donating clothes or house products to your local charity, but we may not have realized how much a charity, such as GOD TV from Olathe, Kansas, would benefit from the donation of a vehicle, like a Chevrolet Cruze. If we haven't thought about it, we should have a little time to reflect how much charities, like GOD TV from Olathe, Kansas, are fighting to make ends meet, or even to fund applications that further their mission. Have you got a unnecessary automobile, such as a Formula 1 Street Com Formula 1 Street Com, carrying space on your driveway or garage? Have you thought about if there's a better use of the car than simply sitting there, cluttering up your own space? We will be able to assist you downsize, and do something good for your regional community. Take a peek at our site. However, the pages of the website are recorded tens of thousands of charities, such as Anne Arundel County Food Bank Inc.. There is guaranteed to be just one in Olathe, Kansas or the local region that talks to you, whose mission that you feel is well worth encouraging. Or, if there's a particular charity which you want you lend a supporting hand to, then you can tell us the name of charity and we are going to contact them for you, to ensure they can receive your donation. Instantcardonation.org is a website that may help you help a charity that speaks to your heart, and also enable you to simplify your own life. It will not cost you anything --you only need to have a moment or two to press on the donate button and send us any information about the car that you want to donate, such as a Nissan NX/Sentra. We'll arrange a free pickup for your vehicle in Olathe or the local area, and record on the auction to acquire the highest price possible so that we can make the most donation potential for your charity of your own choice, likeGOD TV. Not only can you get to give your vehicle from the center, but you are also eligible for a tax-deduction. We'll finish your tax receipt and also provide the non-profit with desired IRS paperwork as well as your donation. Giving from the center couldn't be easier!